La Sportiva was born in 1928, when Narciso Delladio started hand-crafting wooden and leather boots for lumberjacks and farmers in the Fassa and Fiemme valleys (Dolomites, Italy). Over the years La Sportiva has become worldwide leader in boots and shoes for all kinds of outdoor activities. First moving into mountaineering and ski boots, then focusing on climbing shoes as the sport progressed in the 80s. As La Sportiva has grown and developed they have expanded into ski mountaineering, apparel, technical trail running shoes, and mountaineering boots. The majority of their product lines are manufactured in a small company owned factory to ensure top quality craftsmanship. Because of their hands on approach they are also able to operate with a close eye on their carbon footprint, production waste management, and drive the industry forward with their eco initiatives. Here at OutlandUSA.com we offer a variety of climbing shoes for all experience levels. If you are just getting into climbing check out the Trantula or Oxygym. If you are splitting your time between the gym and outside crags we recommend the Finale or Katana. For you more experienced climbers we have plenty Futuras, Miuras, and Solutions available. Not a climber? No worries. Over the last few decades La Sportiva has made a name for themselves in the trail running and light hiking worlds and have continued the tradition of their roots in mountaineering and alpine boots. Many customers who have fallen in love with the brand through climbing are now excited to use them in other outdoor activities. To us the progression is natural and a perfect fit! Check out everything we offer from La Sportiva here. La Sportiva is the italian company worldwide leader in the outdoor industry for the production of technical clothing and footwear for mountaineering, climbing mountain running, hiking and trekking. The core business of La Sportiva take place in Ziano di Fiemme, Trentino, Italy. And these are images and sounds of the brand, directly and exclusively from La Sportiva headquarter. 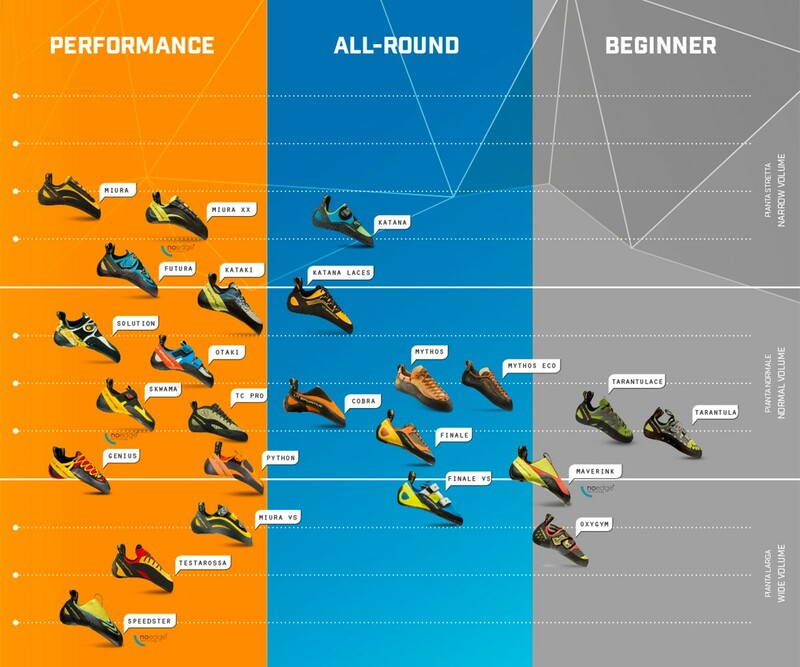 Q: How do I choose the right climbing shoe for my level of expertise? Climbing shoes are meant to be tight to give your feet the support they need to get you up the route or problem. Keep in mind these shoes will form to your foot after use. All that to say is a snug fit is good. Here is a great tool to help you choose a climbing shoe that fits your needs. Q: How do I extend the life of my La Sportiva footwear? Take care of your La Sportiva footwear and they will take care of you. Here are a few suggestions to prolong the life of these shoes and boots. Keep your shoes and boots out of extreme temperatures. Store footwear in a cool, dry location. Never leave your shoes in the trunk of a hot car or in the direct sunlight. If your shoes get wet, allow to air dry and do not use a heat source. Make sure to clean your shoes/boots after each use and re-treat as needed. Q: Which products does La Sportiva recommend for a proper waterproof treatment of the boots? For general purpose waterproofing, we suggest Nikwax Aqueous Wax as this performs the best. Re-apply this product as necessary or after every use in severe conditions. All La Sportiva manufactured items are covered under a Warranty. This warranty doesnt cover wear and tear, improper use, or improper care. There is no implied life span of a shoe, due to the variables that can affect footwear. La Sportivas Warranty does not extend to any La Sportiva product that has been resoled, repaired or otherwise modified. Only original La Sportiva materials and workmanship are covered under Warranty. In case the product is not covered under Warranty, it will be possible to repair it charging all the costs to the end user. Damages due to normal wear and tear will be repaired at a reasonable price.